A cat harness is used to train your cat to walk while on a leash. If you've always wanted to take your cat for a walk, this is one of the safest ways for your cat to explore his or her neighborhood under your supervision. Harnesses are a much better choice than collars, harnesses do not choke your cat when you attach a leash to them, like the buckle collars do, and they also prevent your sometimes mischievious kitty from simply slipping out, like the break away collars. Harnesses come in three different styles and a variety of different materials. The three different styles available for cat harnesses are figure-8, H-harness and the V-harness. Figure-8 Cat Harnesses are the basic type of harness, they consist of two circles that go around your cat's torso and neck, and attach at the back of your cat's neck. The H-harness connects the two loops with an additional piece,it creates the letter H when looked at sideways and reduces the amount of pressure on your cat's neck which helps to prevent neck injuries if your cat tries to pull away. The V-Harness is a vest type harness. The different styles available can make a difference with how easy or difficult it is to get the harness on and off of your cat. It's important to familiarize yourself with the harness and have your cat get used to it before you attempt to take your cat outside while wearing it. Even though we may enjoy buying things for our cats, they usually aren't big fans of new products, so your cat will definitely need time to not only get used to the harness, but also used to the idea of going for a walk on a leash. It's important to ensure the cat harness fits properly - not too snug and not too loose. 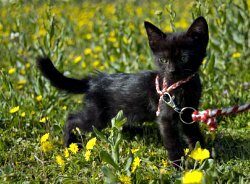 If after your first attempt to take your cat for a walk you find that your cat tends to pull forward, then the figure-8 is the best choice because it tightens just slightly so that your cat doesn’t slip out of the harness, but also prevents it from tugging too tightly and choking your cat. Along with the different styles available, you also have a choice of which material the cat harness your purchasing is made of. Most harnesses come in a variety of materials,which include nylon, cotton or leather, but we found that either a nylon or cotton harness is most desirable for your feline friend. Avoid materials like leather, which can be both heavy and uncomfortable. Below are ten major features that are important to look for in a harness for your cat. The first step is to introduce your cat to the new harness simple by placing it down on the floor and walking away. Cats are curious by nature, before long your cat will be sniffing and checking out their new present. Leave it on the ground, and let your cat come to it. Over the next week, slowly familiarize your cat with the harness without putting it on by placing some of your cat's treats next to the harness and rubbing your cat's blanket on the harness so that it has your cat's scent. When your cat seems more comfortable with the harness, try putting it on and just letting your cat wear it inside the house. Before taking your cat on his/ her first walk outside, do a couple of practice runs inside, get your cat used to the feeling of walking around with a harness and on a leash. You may also want to schedule your cat harness familiarizing exercises around your cat’s meal times or snack times, so that he or she will associate something positive with the experience. If your cat doesn’t seem interested in walking, don’t force the issue. You two can simply enjoy the outdoors together while sitting. Over time, your cat may become more comfortable with the idea of walking outside on the harness and leash. Be sure to praise and reward your cat after each walk. Using a harness provides a safer outdoor experience for your cat. There are many risks to letting your cat roam freely outdoors. These risks include physical injury from fights with other cats, coming into contact with cars, getting stolen or coming in contact with cats that have serious cat health problems such as Feline infectious peritonitis (FIP), Feline leukemia virus (FeLV) or Feline immunodeficiency virus (FIV). Training your cat to use a harness will definitely take a good dose of patience, but it will leave you with a better understanding of your cat. When your cat is when to venture out for a walk, your feline friend will benefit from both the mental and physical stimulation provided by walks outdoors under your safe supervision.